Mon Ami™ is a unique integrated plug-and-play support system that enables a caregiver to remotely (or locally) look after loved ones through a host of services. This results in an increased quality of life not only for the person being cared for, but for all parties who are involved in the care. This enables caregivers to assist their loved one at a convenient place and time, thus helping to reduce stress and magnify the caregiving potential. Furthermore, Mon Ami™ forms the social bridge interlinking family members and friends, mitigating problems such as depression and loneliness. 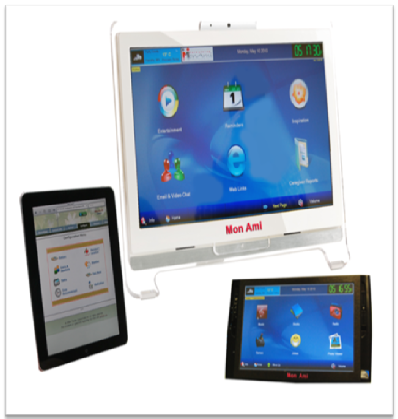 Through the use of transparent plug and play technology, Mon Ami™ provides a vast array of services and functionality. Mon Ami™ can read books aloud, provide the weather forecast, date and time, play music, send and receive emails, guide prayer time, tell jokes, provide inspirational recordings, play intellectually stimulating games, record memoirs, provide entertainment and news updates through Internet radio and much more. To assist the user with daily routines, the multilingual Mon Ami™ can announce medication, mealtime or exercise reminders, automatically control lights and appliances, issue reminders for outside events, appointments or special days in the lives of family and friends, notify the Caregiver if action needs to be taken, and many more beneficial functions. The Mon Ami™ Web Portal allows a professional Caregiver to effectively look after more than one person virtually, allowing them to focus on those who need extra support, as well as automating daily tasks and bringing more structure to their role as Caregiver. Even if you are a member of a busy family with children, Mon Ami™ can assist by helping organize the household through the use of the shared calendar (accessible through the Web Portal) and timely reminders of all the important tasks and routines that exist in every family. Mon Ami™ is like a GPS for daily living (like the Garmin and Tom Tom devices are for navigation). It is important to understand that it is not the Touch Screen device that is Mon Ami™, rather it is the combination of the Web Portal and the many background services that form Mon Ami™. The Touch Screen is just the delivery mechanism, end point and user interface for Mon Ami™. There are many different end points for Mon Ami™, based on the needs of the user. We suggest that you visit Needs Addressed pages as the next step in learning about Mon Ami™. Or if your more interested in the remote caregiving aspects of Mon Ami™, read more about the Mon Ami™ Web Portal. Want to see the Mon Ami™ in action? Click here to watch a short video demonstrating a few of the features of Mon Ami™.